Aboard the Crystal Esprit-Last night, en route to Parga, we traveled under the Rio–Antirrio Bridge, one of the world’s longest multi-span cable-stayed bridges and the longest of the fully suspended type. It crosses the Gulf of Corinth near Patras, linking the town of Rio on the Peloponnese peninsula to Antirrio on mainland Greece by road. 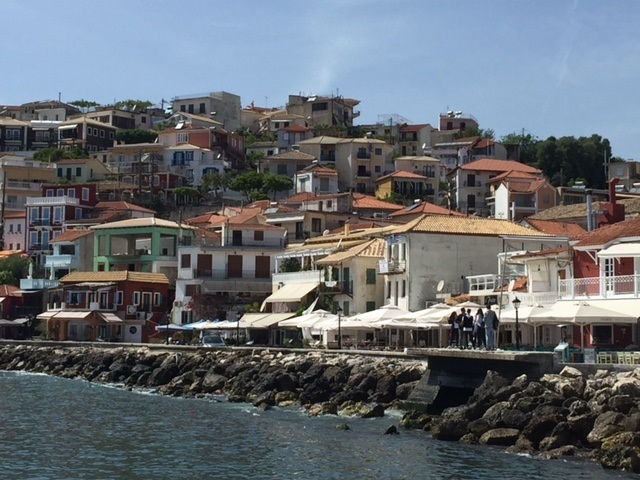 Today, in Parga, it’s all about the olive oil, the liquid gold of Greece. Skipping a tasting here would be like passing up a wine tasting in France. After arriving at Parga via tender (this harbor is protected), our tour group hiked uphill to the Paragaea old factory and museum, where we were shown the implements and machinery (powered by horses) used in making olive oil back in the 1920s. 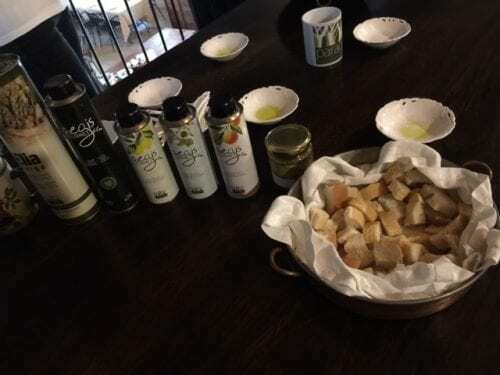 We learned about the grades of olive oil, specifically that Extra Virgin (cold-pressed) is the very best. The industry in Greece is carefully regulated by the government, and the pure olive oil must be labeled as to acid content (the lower the better). The best Extra Virgin must have an acid content of .08 or lower. 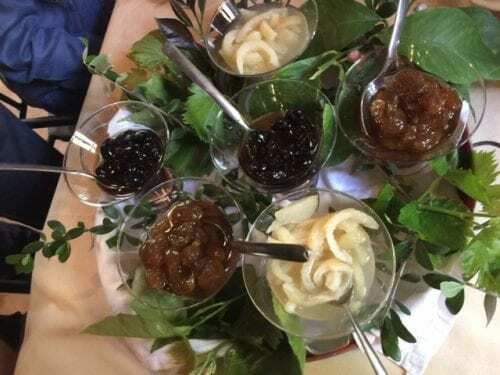 Next came the tasting of some truly delicious (and loaded with anti-oxidants) Extra Virgin oils, which inspired me to buy a couple of tins, one flavored with lemon, which would make the base of a sumptuous salad dressing. The highlight of the visit was the cooking demonstration, followed by a hearty and authentic Greek lunch. 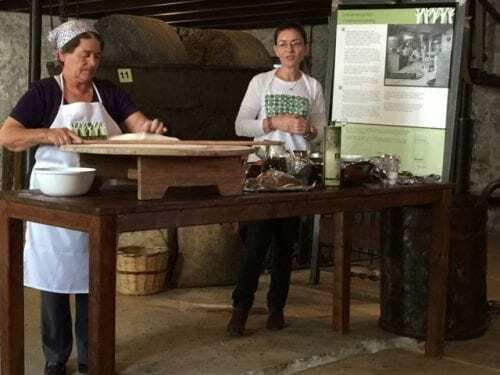 We saw home-made phyllo dough rolled out, which some of us then used to make cheese pies. Stuffed tomatoes, an omelet-like fried patty and a robust lamb dish with potatoes rounded out our meal. Sweet grapes, olives and lemon slices were dessert. When we returned to the Esprit, some hearty souls decided to take out kayaks from the yacht’s marina, this being the first day that complimentary water sports were offered. Though the outside temperature was about 70 degrees Fahrenheit, the water was frigid, so not many passengers took advantage of the opportunity to enjoy water sports. I chose instead to explore the iPad in my cabin, which was loaded with information, not only about the Esprit, but also about all the available services (like shoe-shining, luggage packing/unpacking, room service, etc. ), the entertainment offered on my big screen TV—and the entire week’s menus, from breakfast through dinner. As I haven’t mentioned it before, the food on this cruise has been extraordinary, lavish with luxury ingredients like Waygu beef and fresh truffles and served with fine wines (complimentary).